Lock in a great price for Sentido Cala Viñas – rated 8.2 by recent guests! I checked out a day earlier and I was not offered a refund for that night. They were surprised but did not bother to ask the reason for my earlier departure. They were probably looking forward re selling the room and making a profit. I shall not return to this hotel nor recommend it to friens. Location was perfect. Price per night was very good. Breakfast was very good. Dinner was medium, there was a lot of variety which was good but the quality of the meat could definitely improve. Wifi worked fine! We really loved the "old" waiter who was working in the cave. His music and joy in working was a pleasure to see. Viewing sunrise and sunset from our room on 11th floor. Standard of the hotel, in our opinion, is first class, All staff were friendly and courtous, very laid back, made to feel very welcome. Nothing seemed too much trouble for them. Quality of food is excellent, Will definately return to Sentido Cala Vinyas. Amazing breakfast with very friendly staff. Clean and modern rooms, beautiful swimming pool and beach. Everything was super clean and organized. Very nice and friendly atmosphere. I totally recommend. Rooms clean and comfortable pool area kept clean loads of sun beds and food suited this very picky vegetarian more than enough choice ,also plenty of choice for my meat eating husband . Sentido Cala Viñas This rating is a reflection of how the property compares to the industry standard when it comes to price, facilities and services available. It's based on a self-evaluation by the property. Use this rating to help choose your stay! This adults-only hotel enjoys wonderful views of the Mediterranean and an outdoor swimming pool. It offers a tempting combination of peace and relaxation. All of the air-conditioned rooms at Sentido Cala Viñas have a balcony, most with views of the sea or the cove. Decorated in a contemporary style, they also have flat-screen TV and a fridge. To relax there is the swimming pool, plus a selection of sports and games including tennis and mini golf. Free Wi-Fi is available in the lobby. The hotel also has a spa, where you can enjoy a range of treatments at an extra cost. Pay parking is available on request. 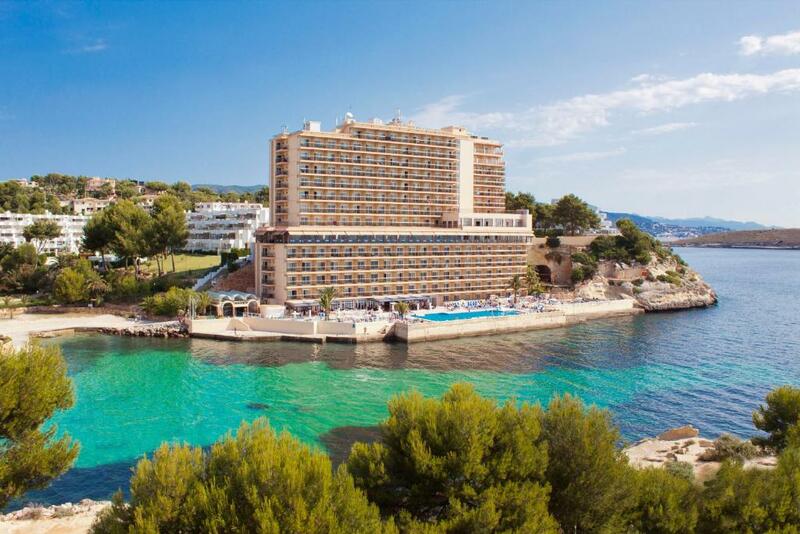 The hotel is located in the southwest of Mallorca, just 19 mi from Palma de Mallorca airport, not far from Palmanova. When would you like to stay at Sentido Cala Viñas? This air-conditioned room comes with a balcony, plasma TV and a safe. It also features a mini-fridge and a private bathroom with shower and hairdryer. This twin room features 2 single beds, a balcony, satellite TV and air conditioning. Wired internet is available in the business center and costs EUR 3 per 30 minutes. House Rules Sentido Cala Viñas takes special requests – add in the next step! Sentido Cala Viñas accepts these cards and reserves the right to temporarily hold an amount prior to arrival. This hotel accepts adults over 18 years old. Robes and slippers were included in room listing but not supplied even after two requests. Nothing negative to say about the hotel. Walls are thin. Breakfast was the same everyday. Mostly older people. Not a lot of food options close by other than hotel. Nice location in a beautiful cape. Great pool and sea access. Nothing. For 4* hotel was everything just great. Lovely hotel - went twice this summer on short trips with friends. Beds was a little to too hard and felt uncomfortable. Nice location, but little to do in the town (closest is magaluf 20 min of walk or 5-6 eu for taxi); friendly staff!! ; Nice breakfast omletes, but little choice of food(boring after 3-5 days(but no problem, tasty bar/restaurant across the street)); 90% of people staying in this hotel was elderly people( so i can say it is an old people hotel(you choose is it bad or good)); great view of sea/pool. Having to reserve the chairs/umbrellas at 8oclock sharp. We couldn't go onto the pool deck until 8, which wasn't made clear unless you try to do it earlier. As long as you know that going in, then you wont be disappointed. I loved that the hotel was right on the water, but not right on the beach. The beach was walking distance, however it was public and very crowded. I enjoyed jumping off of the pool deck right into the sea, it was perfect. The staff were great at trying to get the vacationers to participate in the events. I took advantage of the yoga, aqua-fit, trivia, and countless other min activities. It was fabulous. Unfriendly staff member in the dinner hall.